Angry Warhammer or What have I done lately? 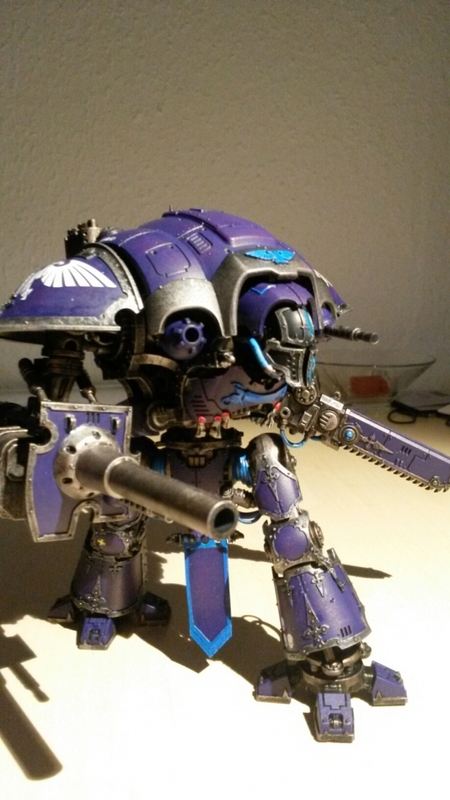 Since the Warlocks journal hosting i have been working on my scifi rpg game and painting miniatures for the upcomming smackdown event 13th of August im co hosting and participating in. 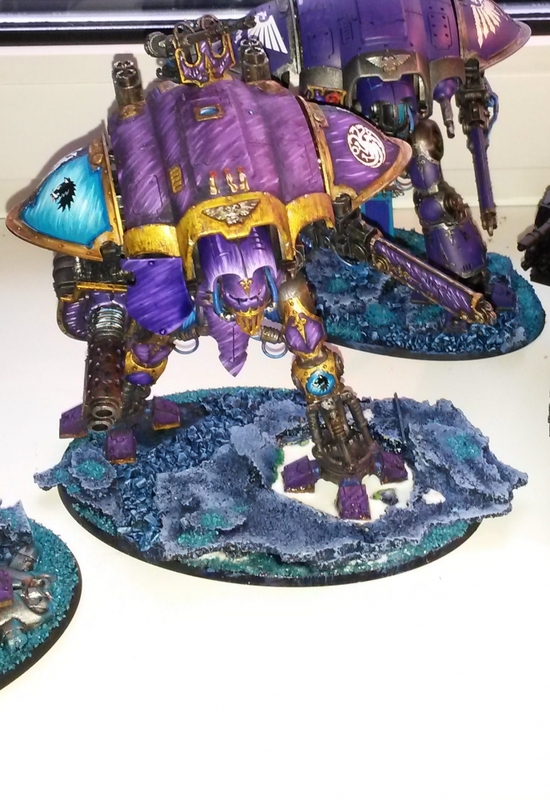 So fair warning, if you have no interest in model paintaing half of this post will be pretty boring and the other half is about RPG and being a GM and how i am doing my best to distill golden nuggets from some great articles on the topic. There is absolutely nothing about my TinyGork work to be read here today. For my scfi game i am gorging myself on various Angry GM articles. If you have been watching my tweets you know that i feel he really manages to distill and put into words all those intangible thoughts, ideas, gut feelings and so on that i have had over the years or that was still slowly evolving out of these 20some years of rpg. What got my onto Angry GM in the first place was the abstract dungeoneering. It was something i had read and put in the back archive of my mind. Suddenly half a year later i found myself half remembering something vague about doing a dungeon in zones. I had to ask around where i could have read it and was eventually pointed in angrys direction. This time around i remembered to bookmark the site and i began reading all his stuff. Now im a fan. Last year i agreed to take over a scifi rpg as our gm was burned out. I am now trying to put alot of the sagely advice and theory from angrygm to practical use. Which is very hard because i am apparently very set in old habbits regarding running a game. Picking up new skills and ways of doing things is hard. Remembering to do something new instead of autopiloting on the old. Its like learning to drive again in a new way while throwing off the old stuff that you have learned by yourself the last 20 years. Recently Angry GM wrote 2 pieces on recap and session structure. Which i am in the process of distilling into highnotes and eventually an actual action plan for me to turn them into practical use. But i did not stop there, i crammed some stuff from his social interACTION and scenes. So essentially im working on a todolist an a howto list. So to create my list of highnotes that felt important to me i decided to try out tags in onenote because i knew that there is a autopage generator based on tags in the notebook. So i copied the two articles into onenote and started tagging what i deemed important points of the articles. Then i used the ‘find tags’ function of onenote to autocreate a new page with only the text fields that was tagged. I now had a list of what i felt were the important bits that summed things up for me personally. I did this for both articles with 2 seperate tags and then i merged the 2 ‘find tags’ pages into one page so i could fit the recap bits into the overall session structure highnotes. 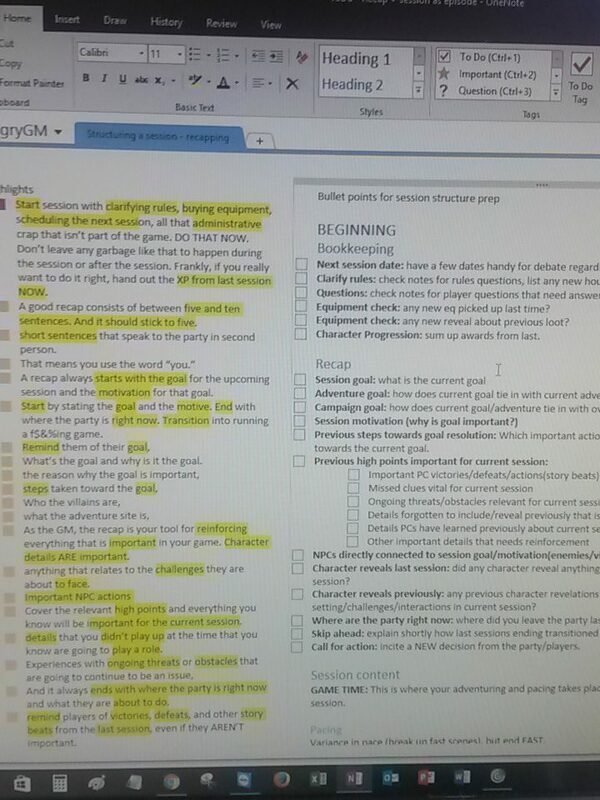 Then i began highlighting words in the notes and alongside the now merged list of tags i began laying out a sort of todo list in as general terms as possible so i can re-use it for multiple sessions in the future. I added in some other articles highnotes in the ‘middle’ section of the session structure. Stuff like Pacing, scene creation, Run your NPCs, Encounter management, Social interACTION and Controlling Combat. Some of it useful for prep some of it for running the game. So it’s not just a todo list. But even if some elements are for running the game they are useful to have mulled over abit during prep. So i have this sort of bullet list that isn’t just a todo list and isn’t just a howto list, which i suspect i will be adding more bullet points to as i go over all the articles again. I also suspect that i will be doing something similar with the Megadungeon series. It is not quite tangible to me yet, but i have this idea of using this series as a guide to preparing a campaign. I’m also getting some warhammer painting done, i finished up 3 imperial knights for warhammer 40k one of them a forgeworld model (those are extra detailed and bigger and in resin) a cerastus castigator. It took me About 3-4 weeks building bases & models and painting them up almost every evening and some weekends. 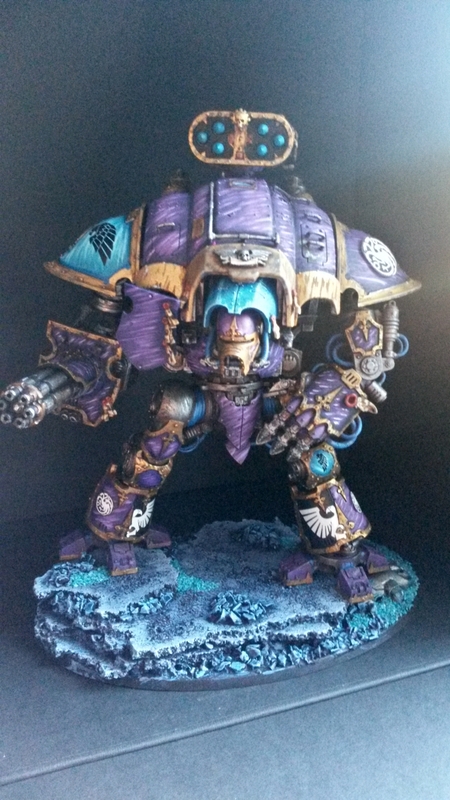 I had one that i did 2 years ago and that was purple so the colour was already determined. However this time i wanted to try and do it more “right” by using colour theory. I found some great articles by theback40k about it some time ago that i went back to. I decided i wanted to do more than two colours and i also forgot all about saturation (more or less). My decision was to try a triad harmony with purple, orange and cyan. It also appears to me that i seem fascinated by the current trend of high contrast going from deep black to almost white with not so soft blending. The first purple carapace was a test run but when i tried to copy it on the last two i could not remember or figure out what i did so they ended up looking slighty different. I ended up doing almost streak like highlighting instead of a softer blend and the result looks almost like purple rain or meteor shower to me. Next hurdle was coming up with a house emblem for these noblemen knight pilots. The story goes that these war robots have been given to noble families/houses so they can protect imperial colonies. These housed either were or became very feudalistic and are very much like knightly orders of old, duty honor etc. So they needed a house sigil/emblem. What to do, this is not my strong side. I eventually found a black white image of the targaryan dragon sigil and made it much smaller, after a few tests i printed and cut them out and tacked them on with postergum. The bases for the Knights was made by placing cork plates upon each other so the resembled rock and cliffs. Then some decorating glass shards and primer. I wanted to keep the bases in an analogue harmony with the purple so tried to do them with a blue tone. 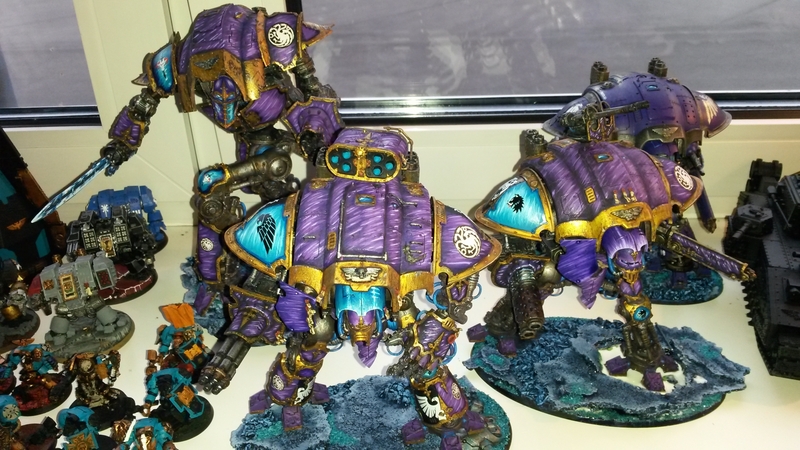 After finishing painting them i added some turkish(cyan) decorating sand here and there for a nice popping contrast and tie in with the knights right shoulder pads and left knee pads which is where their individual knight sigils goes. 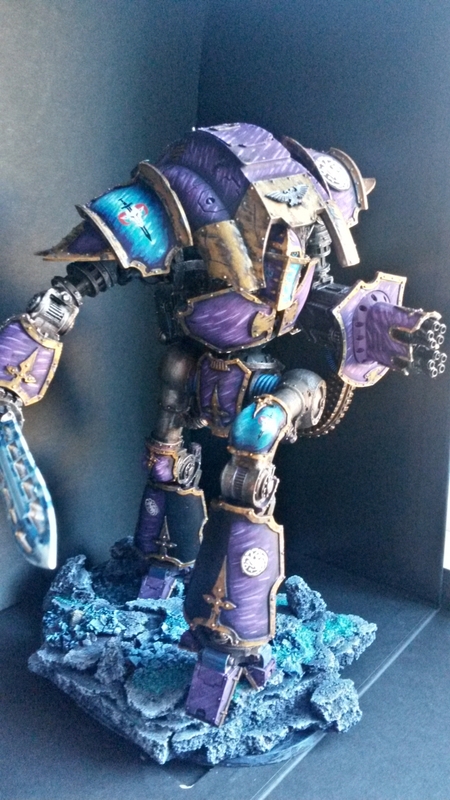 I added some chipping and battle damage to the trims of the tall castigator knight. Though this is an area i am a newbie in i think i did an ok job. The gold trimmings was built up to look aged but not decidedly damaged. But the end result is something i am proud of, still a few details and touches that needs to be done. 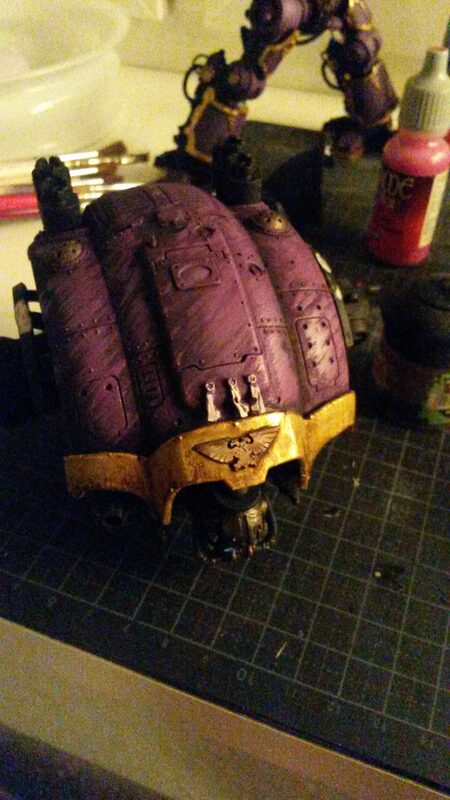 Last night i started painting a super heavy tank called baneblade. I wanted to experiment with a camo theme based upon the knight bases. It turned out somewhat different than what is normally seen but i’m quite fond of the result. It’s not 100% done but well on the way. While writing this piece i got a new project in the mail, some alternative terminator marines with lion head emblems for my home made Doom Lions Spacemarine chapter. Work on these has also begun.